The Commemoration of the Brutal Slaughter of Orthodox Christians Under Kurdish Hordes in Diarbekir of Asia Minor was established by the Patriarchate of Alexandria in 1896, to be remembered on June 30th. Because of its territorial losses in the Balkans due to the Russian intervention and the rise of Armenian nationalism, Turkey began a policy of systematic extermination of its Christian citizens between 1894-1896. Though many refer to this as the “Armenian Genocide”, in reality a great number of Assyrian and Greek Christians equally suffered at the same time. On October 20 in 1895, Turkish and Kurdish gangs began the slaughter of Christians in Diarbekir (Amid/Amida/Diyarbakır). 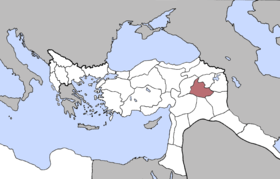 This region was mainly made up of Armenians and Assyrians, yet many Greeks lived there as well. At this time. the Assyrian Church of the Holy Mother of God gave refuge to many Assyrians, Armenians, and Greeks. Here a revealing exchange occurred when several Assyrians suggested to their priest that the Armenian refugees be expelled from the building so as not to aggravate Turkish sentiment. The Assyrian cleric replied: “The people who cross themselves will stay in church to the end. Should we be killed, we will be killed together.” In the end, 119 villages in Diarbekir were scorched and ruined; 6000 Christian families – about 30,000 people – were killed. In October 1895, the Turkish army and Hamidiye regiments entered Urfa and killed 13,000 Assyrians. The massacre in Diarbekir city was one of the most violent and bloody massacres in the period, extensively reported on by the French Consul in the city, Gustave Meyrier. In a later report on December 18, 1895 Gustave Meyrier wrote: “That day at sunrise the carnage started and lasted until Sunday night.” Armed Turks were divided into groups going systematically from one house to another making sure not to disturb the Muslims. “They kicked the doors, looted everything, and if the people were home, they slit their throats. They killed everyone they could find, men, women, and children, the girls were kidnappped.” (Sebastien de courtois, translated by Vincent Aurora, “The Forgotten Genocide” Gorgias Press p.105.) The massacres continued way into 1896. Sultan Abdul Hamid’s anti-Christian pogroms had disastrous consequences for his Christians as up to 300,000 Armenians and 55,000 Assyrians died. Many Christians were forcibly converted to Islam or murdered. About 100,000 people from 245 villages were Islamicized and countless Assyrian women were forced into Turkish harems. The decline of the Ottoman Empire resulted in the coming to power of the Young Turks who saw World War One as another opportunity to rid Turkey of its Christian population, the indigenous people of the country. The massacres spilt over into the mountains north of Mosul and Urmia’s province in northwest Iran. About 750,000 Assyrians in the three regions lost their life along with more than a million Armenians and an unspecified number of Greeks.